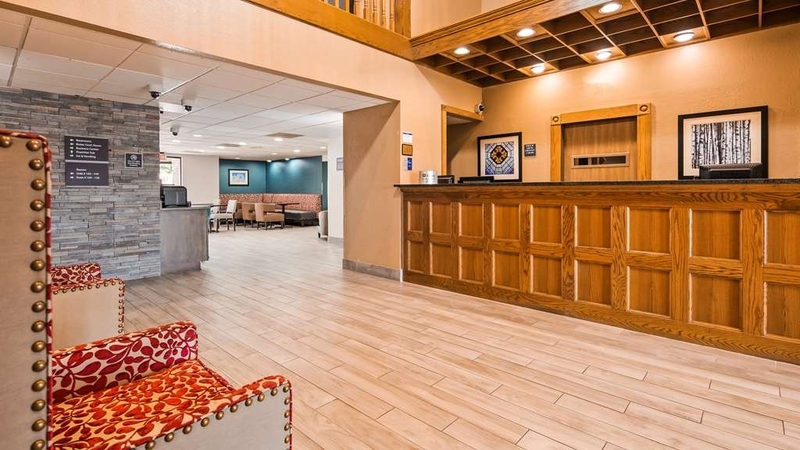 The Best Western Kendallville Inn is ideally located in the center of Kendallville. Come and experience our hotel near the major tourist attractions. Best price guaranteed and exclusive deals. "Who knows what youll get?" Hotel has this scam where they cancel your group rate room reservations so they can charge you double or triple the price when you get there late in the day and are stuck. We booked this place as lodging for our guests for our wedding in the area, and when we got there the day before they magically didn't have our reservations or rooms for a portion of our guests, including the wedding party. I am sure they overbooked hoping people wouldn't show and decided to cancel random reservations in hopes of getting more money or getting people to change hotels. They even called a portion of our wedding guests the week before to "see if they were were coming" who does that? I wrote a bad review before and they called promising they would take care of everything if we took down our bad review, and that their arrogant "customer relations" guy would no longer be interacting with customers, guess what, he's still there and the one responding to customers here. They never took care of the over charging with some of our guests so, bad review goes back up. There is a lot more to this story but it boils down to don't stay here. Kendallville is a great place, and the Best Western there upholds that sentiment. It is very clean, staff are very friendly, and it is easy and simple. It isn't lavish, but it has all the eminities needed for a couple nights stay. Very personable. "Needs updates and better cleaning"
I was not impressed with the quality of my room. It had a cigarette smoke odor, there were cob webs in the corner of the wall, there was hair stubble in the sink, and I lost water to my room in the evening. It does not have a bar to lounge in. They do sell beverages but only until 8:00 PM. After that you cannot purchase drinks. We had a great experience with the BW Kendallville location. Every staff member we interacted with (from desk to housekeeping) was extremely friendly and helpful. We only had a couple of minor issues which they immediately took care of and with great attitudes. 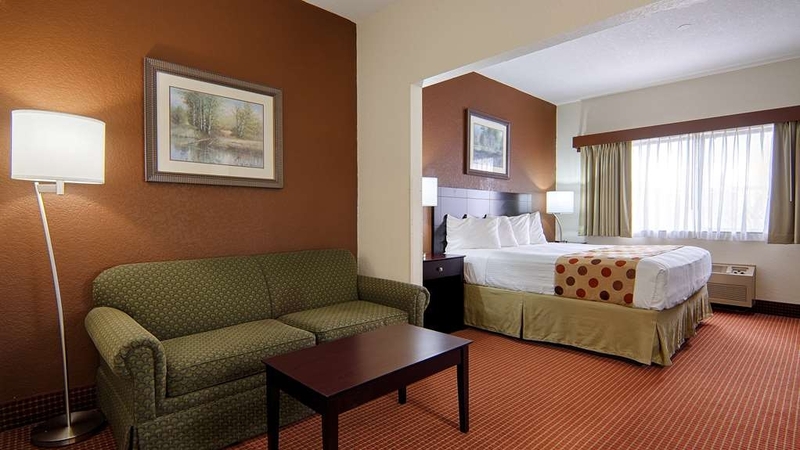 The rooms were very clean and comfortable, and the amenities were great. The only thing I would change is to have an indoor/year-round pool instead of outdoor (so it's not closed during winter), but I suppose that can't be helped. We really enjoyed the breakfast, especially the waffles with all the options for toppings. We will definitely be happy to stay here again. I wrote this before but it magically disappeared. This was the worst hotel I have ever stayed at. During the two weeks I was there the carpet in my room was not vacuumed. They didn't replace supplies. I had to go to the front desk to get coffee, toilet paper, soap, shampoo. They frequently did not bring fresh towels, and I would have to go get those. Didn't empty the trash. I took that out. Find somewhere else is my advice. Awful awful experience. Who would have thought booking and keeping reservations was the hardest part of planning a 250 person wedding, you would think they would be grateful for the business. We had a wedding block set up and rooms booked for months (literally). Myself, the groom, as well as my officiant and groomsmen arrive just after midnight on Friday the 9th with rooms booked for Friday night and Saturday. The person working the check in desk (who had only been working there one month to his credit) said that it was "technically the 10th" because it was after midnight and that because of that they had cancelled ALL of our reservations and would only book us rooms if we paid the full rate of $145/night (which is ridiculous, our block rate was $88 a night and you can still find that price through booking sites) - regardless of that, a small hotel in Indiana should not cost as much as a downtown Chicago hotel at $145 a night but that's another subject. Using their logic of "it's after midnight so it's technically the 10th" I said that we would each take a room for Saturday night at the $145 rate and requested and early check in of 1:00 am for right then and the 'next night' of Saturday. Then all of the sudden it was back to being a two night stay and they would charge 145 for two nights! You can't have it both ways. At this point we asked to speak to someone who could actually manage to do something (again, the desk guy was new). He called the owner Dev in front of us and explained the situation and Dev said he didn't care and was going to bed and not to call him again! Literally word for word what the desk guy said the owner told him! Absolutely ridiculous. I am never the kind of person to throw weight around or even write reviews, but you would think they would want to keep the groom who was responsible for booking out their entire hotel for the whole weekend somewhat happy, or at least not screw them out of their room and rates. Our venue was incredible and I am sure brings tons and tons of out of town guests to Kendallville - we had issues with the only other hotel in town and the venue has already stopped recommending their guests use that hotel, they will be hearing about this experience as well and I would guess have no problems letting all future guests know that the Best Western is unreliable as well. Who wants to guess if they, or their wedding party, are going to have rooms the NIGHT BEFORE the wedding?? We were up dealing with this until past 2:00 am and finally just agreed to the ridiculous $145 rate in order to get some sleep, resorting to deal with it in the morning. 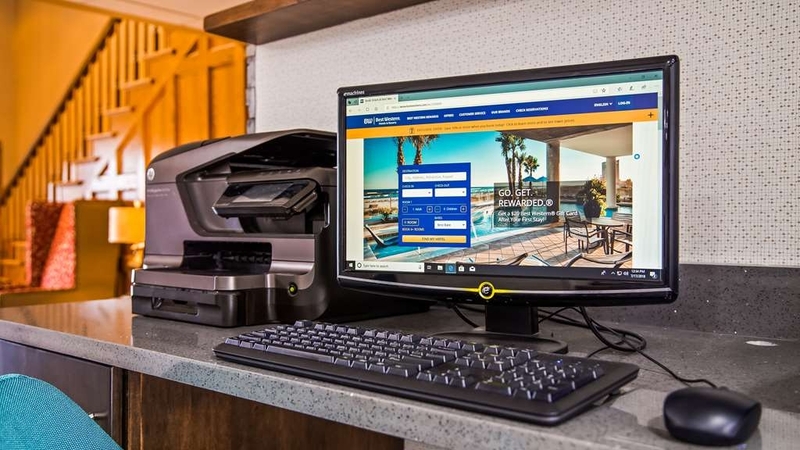 In the morning, the new staff said it was all straightened out and everything was taken care of in regards to the rooms, reservations, block rates, etc. Great right? NOPE! After leaving town we all saw that we were still charged the full rate! After leaving multplie messages at the hotel for Dev and emailing the manager we still have not gotten any response about correcting our bill. I travel for business and many of the people in my wedding party that got screwed do as well, guess they would rather keep $60 bucks from a few rooms and lose a lifetime of future business locally and nationally then do the right thing. Do not stay here, you may show up with reservations cancelled and jacked up rates! I stay here frequently to work at a nearby business. Have been staying here every few months for over three years now. Unfortunately the company I work for will only allow me to stay at this hotel. I will start with my complaints about the room I am staying in as I write this. I walk in, and I am immediately greeted by the smell of stale, smoky air. All rooms are like this. Every time. Second, I walked further into the room to notice a horrid rattling noise from the air conditioner. It is impossible to relax, focus, or sleep with this piece of garbage running. Third, walk into the bathroom, immediately greeted by pieces of a broken towel rack sitting on the counter. Not cool. Moving on, I used the toilet. The seat to the toilet does not want to stay up on it's own, may slam down while you are not expecting it.... All rooms have this issue. Next, finish going to the bathroom, toilet handle must be held through the duration of the flush, or it will not flush. After that, I wanted to take a shower. Couldn't help but notice while I was showering that the water was not draining. By the time I was done, the water was pooled up past my ankles. The plug system they have for the shower was broken. I had to shove a piece of soap on it, in order for it to leave the plug disengaged. Not to mention the fact that they don't have automatic doors, or an elevator. Do yourself a favor and stay at the Holiday inn a couple miles up the road. I have been staying here for years, and nothing ever gets better (aside from the new shower heads) I wouldn't ever stay here if I wasn't forced to by work. Avoid at all costs. First, please note there is no elevator to the second floor. I can handle that....but our TV did not work the first night. No maintenance man on duty and was promised it would be fixed the 2nd day. Nope. They said that many of the TV's had "blown" because someone plugged their Tesla into their outside mainframe box (if someone can access their main electrical source, they have more problems than blown TV's). Also, the maid service left a note that the beds could not be changed because we left personal property on the bed- a COMB! The other bed was not made, no trash emptied, etc. The outside pool was floating with gross green debris that was clearly visible from the breakfast area- disgusting. But the last thing..... The night manager came back up to our room and told me she would comp the room because of all of the issues. That evening, as we walked by the counter, she said "I'm working on the adjustment". THEN, when we checked out, we were told the OWNER refused to comp the room and gave us 2,000 points on the hotel chain. It takes 8,000 for a free room! Basically, he gave us enough points for 6 hours. DON'T STAY HERE!! UPDATE: When I put this review on Google (because that is how bad the experience was), the owner replied with "you were given the opportunity to move and refused". FALSE! The hotel was booked for a craft show at the fairgrounds. 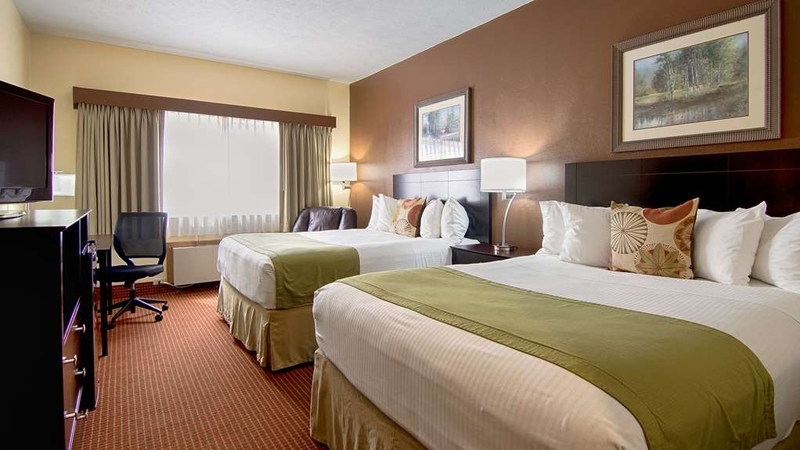 "One of the quietest rooms I've ever stayed in"
I needed to spend a night in Kendallville for personal business. I drove 8 hours and 425 miles to get there and chose the Best Western. I was greeted by an offering of a beverage of my choice ... I chose a beer. NICE and welcome touch! The room was standard fare but what I noted was the quiet ... which is ALWAYS important to me. Aside from an occasional distant train, it was super quiet. I have no negative comments about the stay. 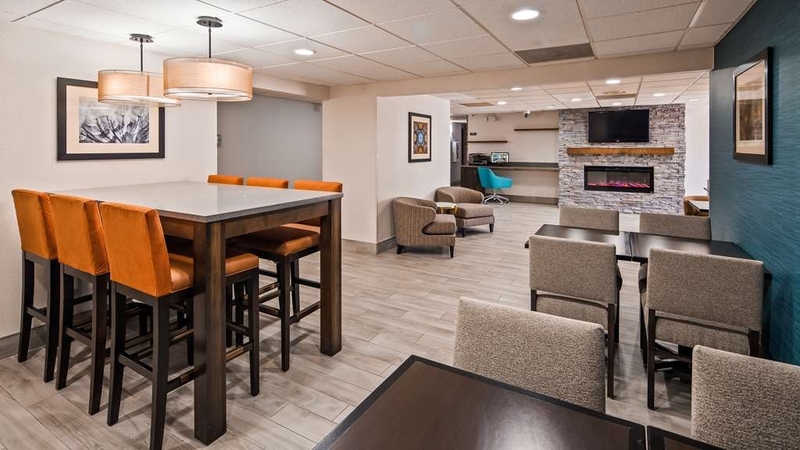 This is one 2 hotel chains in the town of Kendallville, I thought the rate for the stay was way overpriced considering where it is and what you get. 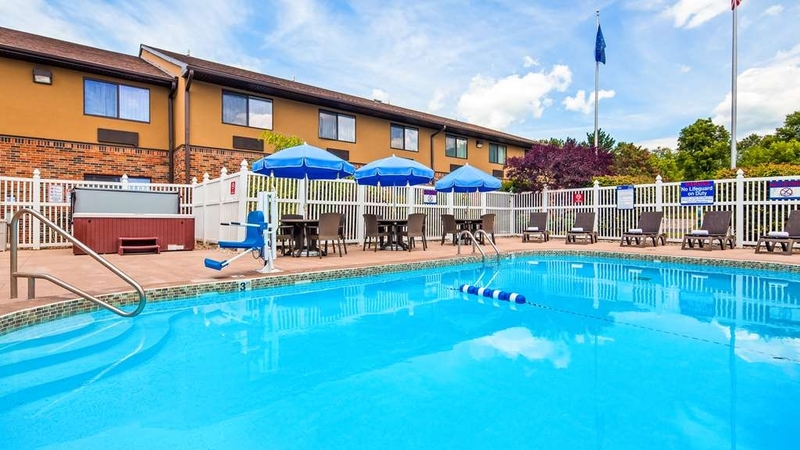 I have stayed here on several occasions and the options are limited and a fellow employee had a horrible experience when she stayed at the competitors facility. The rooms have an odor which reminds me of a stale smelling house that has not air circulating. I have stayed in several rooms on both floors and it is the same regardless. In spite of their renovations the bathrooms are still sub-par. My particular room last week had mildew stains all over the caulk around the handle for the shower. Not really my idea of clean. We stayed one night on an extended trip. The room was as we had requested. We found it to be very clean and comfortable and quiet. All in all an enjoyable stay. An added bonus was a discount at the restaurant next door. We would stay again. I have stayed in this motel before and always been completely satisfied. This time my companion and I ended up with a king room when I had booked 2 queen beds several weeks in advance. I was not happy when I saw the room. I immediately called the reception desk. The young man on the desk called the manager and said he couldn't change the room. I was supposed to be satisfied with the room since it contained a sofa bed. If I wanted to sleep on a sofa bed, I would have booked that kind of room. I was tired and expected to have a queen-size bed to myself. I asked the young man on the desk about at least getting a price reduction. He referred me to the morning receptionist. In the morning, the receptionist told me she could not change the charge and gave me the manager's phone number. I left a message since the manager didn't answer her phone. Several hours have passed, I have moved on to my next stop, and the manager has not yet called me. If you don't care whether or not you get the room you reserved, the rooms are clean and modern, and there is a good buffet breakfast. "BEWARE: Don't give them your credit card number!" Whatever you do, don't book this hotel. We are currently fighting a $300+++ credit card charge for rooms that we had booked and cancelled weeks in advance of the cancellation deadline. The hotel refuses to acknowledge that we cancelled the rooms. The manager, "Dev", and his front desk supervisor Miranda, are highly unprofessional and unethical. I called the hotel to cancel the reservation several weeks before the stay, and then got emails "confirming our upcoming stay". Each time (and there were 3) I called the hotel to say that I had cancelled the rooms. Each time they said, "Oh sorry about that...it's cancelled", but never sent an email confirming the cancellation. Obviously that was a red flag. I shouldn't have let it drop until I had the cancellation in writing. BEWARE of highly unethical practices at this hotel. Don't give them a credit card number. Once they've got it they'll bill it, whether you stay there or not; whether you've cancelled the reservation or not. "Outstanding Value for the week... Enjoyed the local County Fair..."
Showed up without a reservation... Miranda was incredibly helpful. We needed a room for the week, and extra room on the weekend for another family member who was coming into town on Saturday. Miranda provided a speedy check in, reserved the extra room, and got us all squared away. No elevator, but we're young!! The breakfast was great.... and they have a REAL hottub... not a cement hole in the ground filled with hot water... an actual 5 seat jetted hot top with a cover to keep it hot. I never made it in the pool... spent my free-time in the hot-tub. I'd consider this a solid 3-start hotel. this isn't a hilton or marriott or double tree. Its a best western. 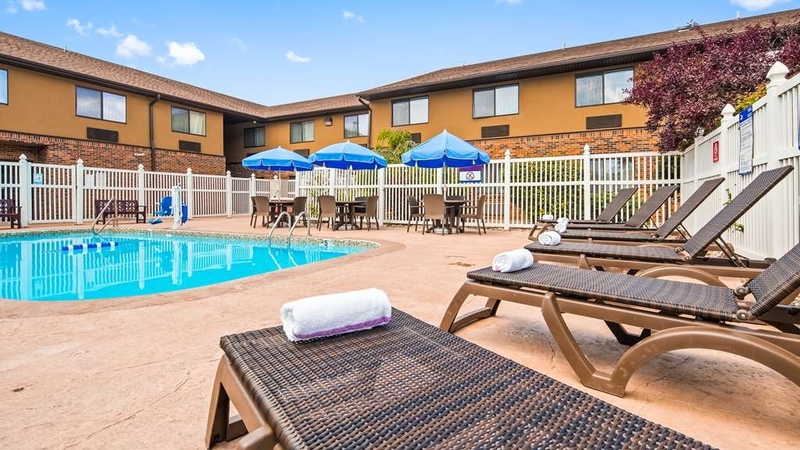 The price was great, especially given the hot breakfast, pool and a base level workout room. 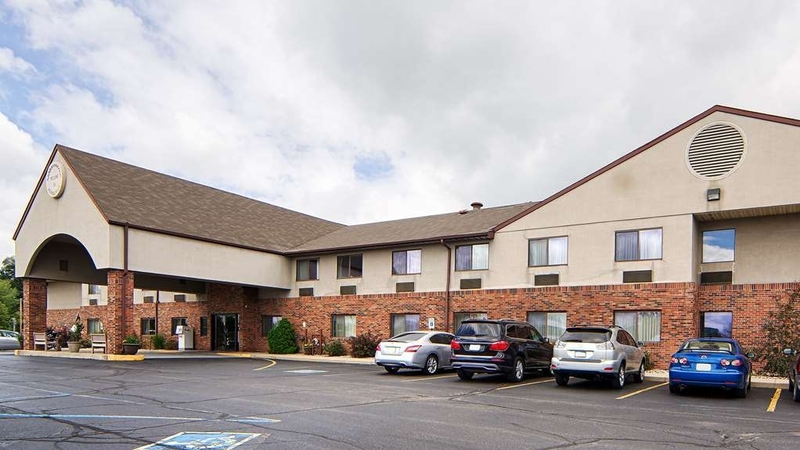 The building and carpet are dated... and its probably due for an upgrade.... but the service was outstanding, the rooms were clean... easy on and off the highway, and a stones throw to the backside entrance to the fair grounds. Could not have asked for anything more. Miranda helped get me setup with the Best Western rewards program, and informed me that they'll match my status at IHG or Marriott or a few others... whichever is highest... They offer 1 free drink per guest each night from 4 to 7 pm... and there was fresh popcorn and cookies out each night. If you are heading to Kendallville... don't hesitate to make a reservation here... If you don't want to fight for parking spots... ask for a room near the back left of the building... everyone parks out front and walks... you can park in the back, use your card to get in, and be right there at your room. and you are far from the lobby noise. The hotel appears to have had a facelift recently, and looked much nicer when we arrived than the outdated online photos indicated. Room was very clean and nice, great air conditioning, and the front desk staff were super friendly and helpful. Price was higher than expected, but it was during an event in the area, and I'm sure they change pricing based on such times of higher demand. Will plan to stay there again! "Friendly Clean Place to Stay in Kendallville"
Had to pardon some dust during our stay as some remodelling was underway. But room was clean and comfortable. The staff was friendly and helpful. The only thing that would help this hotel would be an indoor pool. I would stay here again. 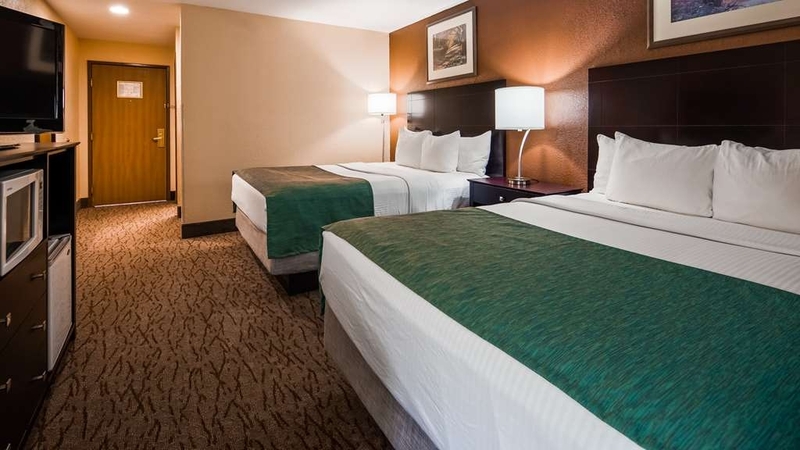 Clean rooms, friendly staff, comfy beds, free breakfast, all the things you look for in a hotel stay. One free drink a day offered too. Staff exceeded my expectations. Great value. I'd stay again anytime! The staff here goes above and beyond. They were so welcoming and helpful. There was free popcorn and snacks in the evening which was great. Also a free drink of choice. All this was unexpected because it is not advertised. The room is a typical hotel room. Breakfast was nice. What gave this a 5 star for me was the attention to detail. Very clean and did I mention the SNACKS. All staff was kind and pleasant. I would definitely stay here again if I needed a hotel in Kendallville, IN. We are all so happy to hear how much you enjoyed your stay. We look forward to seeing you again in the future. I would like to apologize for not exceeding your expectations. We will use your feedback to help improve our hotel. We hope that you will stay with us again so that we may better serve your needs. Thank you for your feedback. "Nice place, great location, nice people." Great place to recharge after a long day of work. 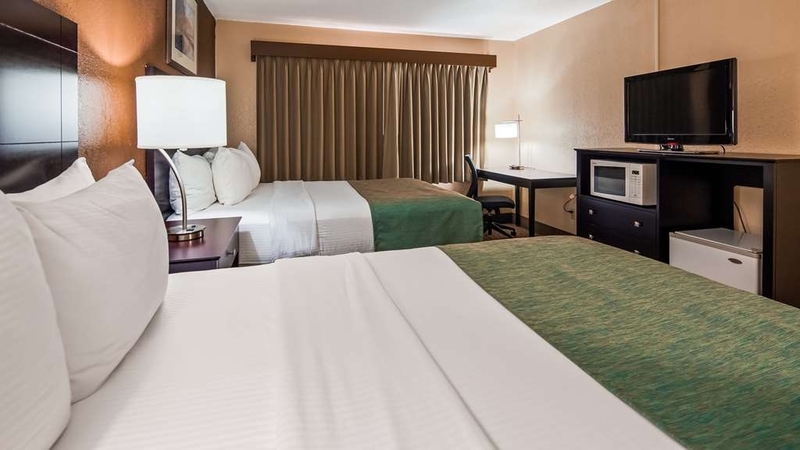 Friendly and helpful staff, great rooms and amenities. Fuel and food right next to hotel. Everything you need,very convenient. Minimal traffic and plenty of places to shop. Not many frills, but a solid budget choice. Easy access to the Interstate and to Fort Wayne. My room was across from an exit door, so it was loud, but the room was comfortable. The bath tub could use a refinish--it was clean, but the finish a bit worn. 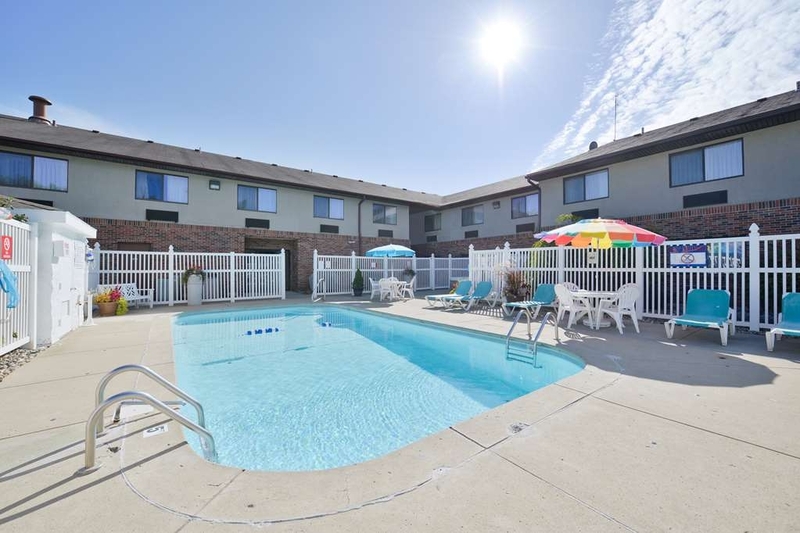 Still, they have a few amenities like a pool, breakfast, internet, etc. The fitness room is pretty basic, but looked clean. Staff was nice. Reasonable pet policy. Would definitely stay here again. There was construction that made it difficult to figure out how to get into the parking lot in the dark, but it was more obvious in the daytime. This hotel was difficult to find due to construction.Better signs would have been helpful.The breakfast was good,although after 8 nights in a hotel,there was nothing that was above average.There seems to be the same offerings of breakfast at every hotel.The air conditioner didn't cool very well and definitely affected the sleep quality. Stayed for one night on business, there are two hotels in the area and I do believe this one was the right choice. Very friendly check in and the room was very clean, the bed was OK the pillows could be better. I did enjoy the breakfast and would most likely revisit the establishment if need be. Each and every staff member we had contact with was polite and friendly. The experience will be even better when the remodeling is done. Our breakfast was varied and adequate. Cookies and snacks are a nice touch. We appreciate your efforts. This is an older hotel that doesn't have an elevator and has a pretty small breakfast eating area. It was clean, but the beds were not comfortable. Overall it's not a bad place and it's in a decent location. It's probably the best hotel in the immediate area. "sqeeky floor and no elevator"
My stay at BW was satisfactory except for the squeaky floor above me ,I thought the floors were all concrete so I don't know what caused the squeak.I would have stayed up stairs except my wife can't climb stairs and there was no elevator. Oh where do I start? I have only stayed at this Best Western twice, but I can't wait until we go back. I Love the staff, all of them. Amy and Miranda are always hard at work trying to make sure everything is going well and everyone is happy. They seem to genuinely care about everyone staying there. There are other front desk girls that I just met this past stay and they are just as wonderful. The cleaning staff is great, too. I enjoy talking to Neena, she remembered me from my first stay and welcomed me as soon as she saw me. The pool is beautiful and clean and the hot tub is amazing! I can't leave out the super nice lady that takes care of breakfast, she's always nice and always making sure the breakfast is hot and ready. 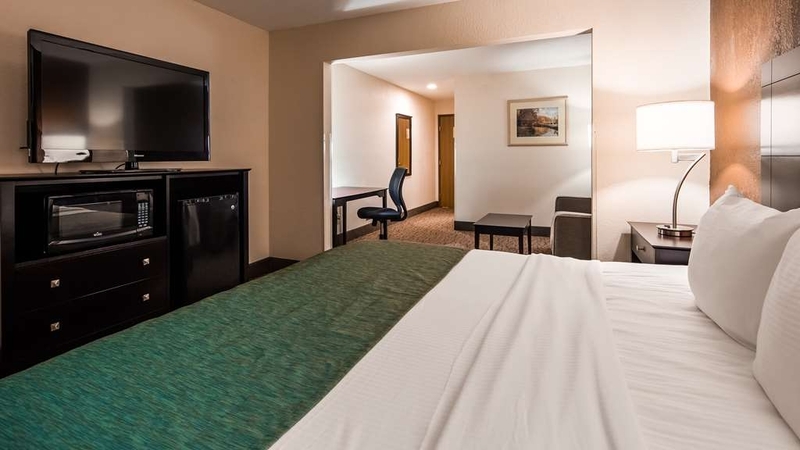 I should mention the hotel is located close to several restaurants and gas stations which makes the stay even better. very nice hotel with staff that is very caring and helpful. good location with restaurants, gas station/convenience stores, and shopping very close proximity. night life and other fun activities also very close. Our golf group stayed here for 4 nights in June and the staff was great. I have to give Caleb a thanks for making waffles at 5AM. The location was great since we were golfing multiple courses in northern Indiana. "Ok but unsatisfactory customer service"
Standard Best Western but the lady at the check-in counter was extremely rude. Yes, please have attitude towards your guests who just took 2 flights and traveled 3,000 miles to get there. I'm sure that's exactly the interaction they were looking forward to upon arrival at their destination. 7 of my friends and I stayed here to play golf. The staff was great and the rooms were clean. Breakfast was delicious. Special thanks to Shai, Amy, Kim and Miranda for the excellent service. Maybe we'll see you next year. "Acceptable Place to Stay in Kendallville"
I would stay here again. Room was a comfortable size and clean. One of few places to stay in Kendallville. This place is convenient. The breakfast was a traditional mid-western sausage and biscuit with option to make sandwich. Appreciated friendly staff and quick check in. This is a well managed hotel and excellent for overnight business trip. Had to leave early and appreciated early breakfast items. Pool looked well kept but did not have a chance to use it. "Overnight stay. Golf group of 12 people"
Good place to stay. Friendly staff and good service. This was a golf trip for 12 golfers. We stay at this Best Western because it is convenient to the golf courses we play, as well as offering good service with a friendly staff. Staff were extremely helpful! We had a problem with the tv and the staff came immediately to fix the problem or find us another room. The only negative for this hotel, it has two floors and no elevator. If you are handicapped, be sure to request a room on first floor! I will stay here again! Rooms were standard. Beds were a little hard and pillows were a little worn out. Good water pressure and temperature in the shower, towels were a bit old and scratchy. My AC unit fan rattled very badly on and off during my stay, luckily I am a hard sleeper. Breakfast was decent with eggs, sausage, biscuits/gravy and waffle maker. Wifi worked decent. You do get 10% off at Applebee's across the street, plus a free beverage at the hotel after 3 PM. "Five Stars for an Economy Motel"
I traveled to northeastern Indiana last week to pick up a puppy. The closest town to the puppy's location was Kendallville, Indiana. 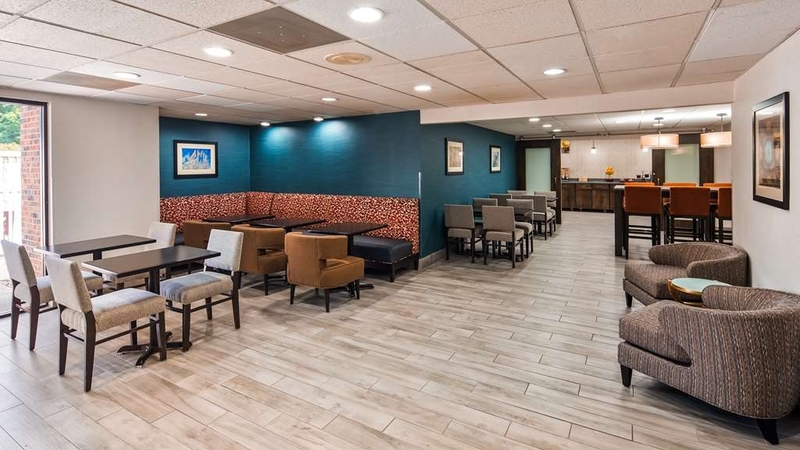 If I ever have occasion to visit that part of the U.S again, I will definitely stay at the Best Western Kendallville Inn, and I recommend the place to anyone driving in the tri-state (Ohio, Indiana, Michigan) area. First of all, there are some quaint little towns in that section of Indiana. We passed through one just over the Ohio border called Hamilton with it's own lake right in the center of town. Second, the motel was convenient to the small Ft. Wayne suburb where I went to pick up my puppy. Finally, the motel itself was spotless, the "make-your-own" waffles on the breakfast bar delicious, and staff gracious and accommodating. The night manager, Miranda, went out of her way to make three road-weary motorists from Baltimore feel comfortable and well-fed. (We didn't arrive in Kendallville until around ten p.m., so Miranda gave us a list of restaurants within walking distance that served late-night meals. We chose the Applebee's across the parking lot because we also felt the need for a post-highway cocktail. Here's another bonus - Kelly, the bartender at Applebee's took good care of us and didn't make us feel rushed, even though we were among her last customers of the night.) I cannot say enough about the welcoming atmosphere at the Best Western Kendallville Inn. I booked our room sight unseen and was so glad that I chose this place. I stayed here 4 nights and it was tied into a golf outing. We played 4 courses in the area. This is popular with this hotel as I meet a number of other golfers. Also staying there were a number of men working on the roads and construction. Two hotels in this town. Holiday Inn Express and the Best Western. It is a small town. Service was very friendly and nice at the front desk. They have a small lobby with a couch and couple of chairs. I had a room with two double beds on the first floor. Average room showing a little wear. It came with a frig and micro wave. It was the special needs room. The shower was really the only difference. The shower had a hand held device or you could hook it up and be stationary. The water pressure was very poor. The first morning I had to kill a large spider in the tub. They have a pool and hot tub outside. They have a small bar in the hotel that I was told it has been closed two years. The doors are locked and you can still the bottles of liquor on the shelves. Strange. There is an Applebee's with in walking distance. Free breakfast at the hotel in the morning. The usual items. I see a lot of people taking the stairs. Not sure this hotel had an elevator. Did not see one, but did not look since I was on the first floor. Apparently when you check in, you can get a free drink. Pop. beer or water. I did not know this until I was leaving. I was not told that at check in. Ask for it. All in all, I was not in the room much. I golfed a lot and was in the room very little other than to sleep. I have stayed at this hotel for the last few years over the 4th of July weekend. I booked my room online at bestwestern.com and made a request for a room on the first floor (no elevator at this hotel) away from the fairgrounds. When I arrived we were first assigned to rooms on the second floor by the fairgrounds. I pointed out my request. I understand it is not a guarantee. The employee told me they cannot see any requests that are made when booking a hotel room online at bestwestern,com. He said the only thing they use the main website for is to fill their rooms. He said if I had a request, I would have to book the room directly through that particular location. They moved us away from the fairgrounds after some discussion but could not move us to the first floor. The floor of the tub/shower is very worn and slick. Could be dangerous when showering. Would not stay there again. Very friendly, helpful staff! My husband and I had been awake for 18 hours, driving 8 of the 18 total for 2 new chinchillas to our show line breeding program. We arrived at the hotel at 8:30 am to inquire when the earliest check in would be as we were extremely tired. The receptionist was lovely and took all action to be sure we got to lay down and rest as soon as possible. Our white german shepherd received all kinds of love and attention from the staff and lots of treats. :) highly recommend this hotel!! Will be back! "Older facility that charges too much"
They charge big city prices for an older place in a small town. The place is clean and all, but really they charge too much. If everything was brand new, I might not have not whined so much about it. The breakfast they serve is OK, but the food counter and seating area is too small. Should use their profits to upgrade the place. A a complete disaster. I tried making reservations directly to the Motel. I was given higher prices and a 20.00 fee a night for my small 6 pound dog. Last year it was 15.00 per night. They were going to have to switch rooms for a 2 night stay and I asked for a King Size bed. The front desk person was very abrupt, so mI said no thank you. . I than called a online service for the same motel. There rates were cheaper and it was only 15.00 a night for my dog. I paid for a King bed size got a Queens size bed, the room smelled funny and was dank feeling. Air conditioner was old and rattling. The management I dealt with were not very nice but put on one of those no problem attitudes. The breakfast was soggy and greasy. When the front desk clerk found out I had a dog she wanted me to bring her my credit card to charge me more. Disgusting attitude she had. We had such a rough time sleeping with all the air conditioning noise we forfeited our second nights stay and left. I will never stay anywhere in Kendallville again. Our yearly visit to the area, we will stay in Shipsawana, the atmosphere feels and looks much nicer. We visit deceased relatives every year, the meaning for our yearly visits. Never again will we need to pass through Kendallville to remind us of our last trip. I stay here every year over Memorial Day weekend for the Kendallville Bluegrass Festival, and the service is always excellent. Amy at the front desk was very friendly and took great care of us. The free popcorn and fresh-baked cookies in the lobby are a great bonus! I've always had good housekeeping services as well. No elevator, so if you can't do stairs, be sure to request a first floor room when you make your reservation. multiple of the staff were incompetent. my bill was incorrect and not fixed to this date. they charged my credit card WITHOUT authorization. I was to stay for 3 days which I did. they checked me out of my room for some mysterious reason and at midnight some unsuspecting guest entered my room as I was asleep in it. clerk at desk could not get bill correct or print a receipt. I asked her to call the manager who fared no better and overcharged a second time! room was not cleaned until last day when asked. also be aware that loud trains go by this town frequently including the middle of the night. I just stayed at this establishment for two nights to attend a graduation. Breakfast was excellent, upon check in the room was clean. I was very disappointed when I returned to the hotel at midnight on the second night to find there was no maid service. There wasn't enough toilet paper stocked, dirty towels still laying on the floor, basically room was exactly how it was when I had left that morning. If this was a economy hotel I would expect this, but for $85 a night you should have your room tended to daily. Next time I return to the area I will be checking out the Holiday Inn down the road. Old Hotel, Swimming pool was drained and falling apart, No water pressure, offered free drink than said we could buy one at the pip machine less than 2 hours later. Breakfast was Great though... Will NOT return! 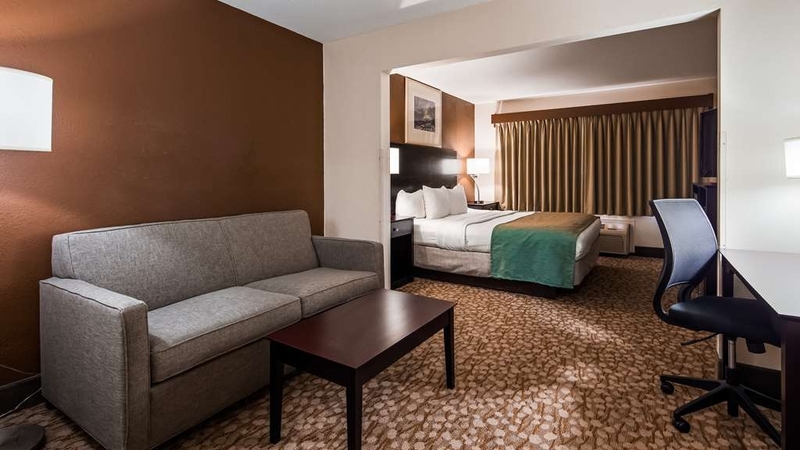 "nice hotel but needs elevators"
"Attentive friendly staff made this stay wonderful!" Wonderfully attentive and friendly staff & a spacious room made this an enjoyable stay. The only real downside was the road noise outside. 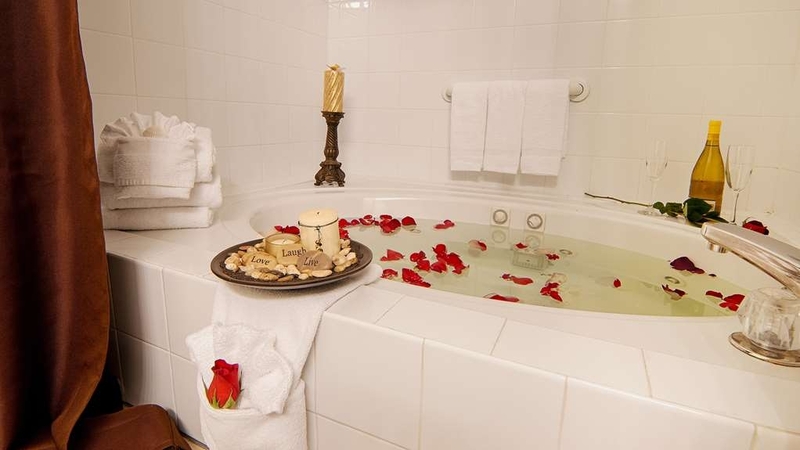 The jetted tub in my room was wonderful, though the controls looked dirty, and I hesitated to use it. (they must have just been stained, because my attempt to clean them was unsuccessful, and based in the cleanliness of the rest of the room, I used it. The evening drinks (first drink free) was a wonderful surprise, and very much appreciated! I've stayed here before and was satisfied. This time there were very few occupants, and our room was not serviced / made up with fresh linens or towels one day. Also, our room was next to someone who had their TV on all night.- I realize staff has little control but one would think we'd be placed NOT next to each other with almost vacant occupancy. Dear David, Thank you for staying with us and sharing your experience. I am extremely pleased to know that you liked our hotel and enjoyed our manager's reception. We are looking forward to see you soon during your next stay. Warm Regards, -Management team. Stayed here to visit the Black Pine animal sanctuary. The room was clean and in working order. The staff was friendly and helpful. It is a very small town and does not have many options that are not bed and breakfast. The room had a working jet tub and the room worked well for us. Nice place to stay the next time we visit the sanctuary. Everyone was great to work with. Breakfast was good... I forgot my earrings and the staff called me to inform me! We had a total of 15 rooms booked by our quests and everyone enjoyed the accommodations. "Nice place to stay in Kendallville"
There are several rooms that are already renovated. These rooms are really great. The older rooms are ok. The staff is always really friendly and helpful. The breakfast improved a lot compared to my last stay about half a year ago. "Great one night visiting friends"
Great hotel and friendly staff. Our kind room was clean and smelled fresh. Decor was hotel decor but was pleasant. There could have been better water pressure in the shower, and an elevator would have been nice for our second floor room, but I can't complain at all. hotel was very quiet. "Probably the best in Kendallville"
No bar on site, loud A/C Heating and a poor breakfast with lousy coffee.... but there is next to no competition in town. There are resturants nearby and a good donut shop down the street.If you have to stay in Kendallville this would be my choice. Stayed to visit family. Staff was very nice and helpful. Breakfast was one of the best I've seen. Overall a great stay and will be coming back again. Internet was fast enough to even run Netflix on 2 I pads with lagging. This hotel does not have an elevator. Even though we requested at time of reservation, confirmed prior to trip and verified upon arrival first floor rooms multiple times for several of our senior family members, our requests were not met. "The return from Route 66"
"Best Western of Kendallville, IN"
Printer did not work to community computer. No USB ports in room, room not cleaned until after 4PM, done earlier if only requested, not enough bath towels, towels were very small, guests were barefoot in the breakfast area, so unsanitary, drier did not work well. Upon arrival, check in was great. My family, who just spent the day playing in a softball tournament and were exhausted, went to go to our second story room in the elevator and found there was not one. We drug our bags and bums up the stairs. The pool was closed for repair, the kids were crushed. The beds were great! The shower had very little pressure. When looking for a dropped item we found popcorn on the floor under the bed. The Room was clean and comfortable. The Hotel Staff very helpful inspire of problems with my Reservation. I had broke a 3 night stay and was not in the computer. I even had my confirmation email from the Hotel on my phone. Staff worked with me to find a room. Excellent breakfast buffet. Best I've seen. The staff treated me as if I were their only guest from the moment I walked in and every time I passed by their desk!! The room was comfortable and clean which is all I ever ask for. The breakfast was hot and the breakfast bar was constantly checked and cleaned as needed. i really like this place and will stay here again if my business travels pass this way. we had to attend a funeral and my error on the date was wrong, manager worked with me and al waa taken care of. the room was good, clean and comfortable. the staff was all good. the breakfast bar was good also. if need be back in that area again we would stay again for sure. I was in town for business and decided to stay at this Best Western after reading the positive reviews. I was not disappointed. The hotel staff was very friendly and accommodating. My room was very clean, the beds were comfortable, and the breakfast was good. I would stay here again. The BW is what you might expect. The rooms are clean and the beds ok. Our daughter had a room at the end of one of the halls near the park grounds. The horses in the horse show were a little noisy at 5:30 am . Didn't bother us. There is a breakfast that is ok. No elevator so if trouble climbing stairs ask for a first floor room . 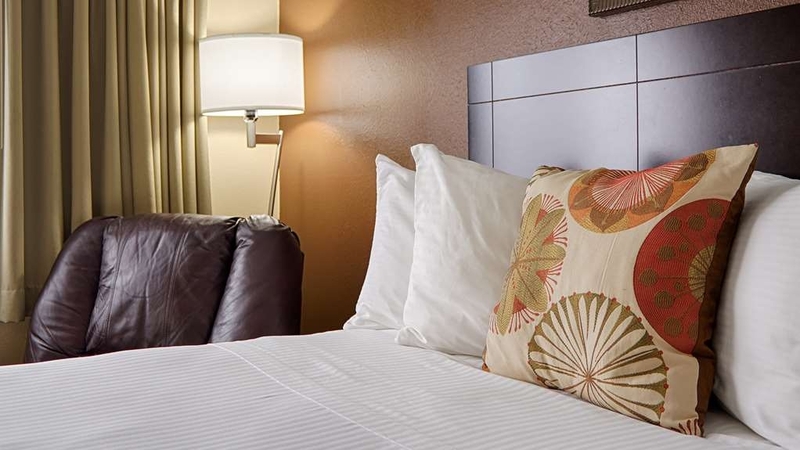 The personal was very helpful and the rooms were very clean and had all products one would need for their stay in Hotel. I would recommend this Hotel to a friend or family member. I can't wait to stay another Best Western on our next vacation. "Nice, clean, new shower "Obama" shower head trickles water"
Nice, refreshed rooms. Great service. However, like so many hotels which follow draconian .gov tyrannically "EPA" regulations when they remodel, takes the pleasure out of the stay. Sink facet sprays more air than water. Toilet does the "partial" flush unless the handle is held down. Shower head flow is abysmal. No elevator. Stairs only. Not fun when coming in tired later check in. Rating would have been 5 star if it were not for the poor execution of the new "Obama" bath regulations. Plus no elevator to the second floor. "great place to stay for golf trip"
have been going there for a decade every summer - nothing special but rooms are clean and never have issues. they did close the bar down this year but there are plenty of other places close by both great restaurants and places to get a drink and watch sports at. 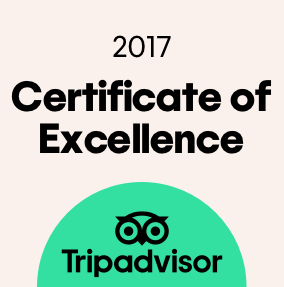 I have stayed at this location several times and have always had good service. It is a convenient location, parking is adequate, rooms are decent, breakfast is satisfactory. I will stay here again, I'm sure. "Give Amanda a raise...she's outstanding"
Amanda made the stay better. She made all situations workable. Changed my mom's room to a first floor location. Secured a small discount on another room because of a problem with missing linens. She was friendly, hard working, approachable, and a stellar front desk service professional. Thanks, Amanda! The morel was perfectly located for was planned for us to do.We had a great room for the disabled.I would be very pleased to stay again. we did no try your breakfasts because we got out bed too late. We are both in our seventies and disabled. The staff are very service minded. This is a fine hotel. We only had issue with the lighting that was newly installed and not "dialed in" yet. They have auto lights that come on from motion. Great if they work correctly but not when they are too sensitive. Also they should be able to be turned off. Outside of this, the rest of the hotel and room are very nice for the price. room was great! clean and very nice. We stayed on first floor and convenient to the exercise room and breakfast. Breakfast was very good. The best part was the way we were treated! awesome customer service. Yes there is a train but to some people that is a very good sound!!! Front desk personnel were very friendly. Only stairs to get to rooms on the second level , so you have to carry your luggage, or the front desk often asks to help. Exercise room is one bike and one treadmill. Location is good but highway can be quite noisy. My biggest complaint is that there were very few cars in the parking lot, yet when we came back after visiting family, our room was not cleaned. This is not what we pay for when getting a room. Because we had prepaid our room online, there was no compensation. I would stay in Fort Wayne and travel than stay here again. Staff was so so accomadating, went out of their way room was so great. We checked in late and they have arrangments made with the local restaurants to give at least 10% off your bill. Close to alot of fun and exciting things to do. Becky was very friendly and professional. She showed that she appreciated my business. That is very important to me. The beds are very comfortable and the amenities are perfect for my needs. I will definitely continue to stay there when I am in town for business. "Pleasant, helpful staff and clean"
room was clean, breakfast was good with good variety of protein, breads and fruits. Staff was very pleasant and helpful. The location was easy to find and not noisy at all. Convenient to everything we needed to do - but then in a small town everything is conveniently close. 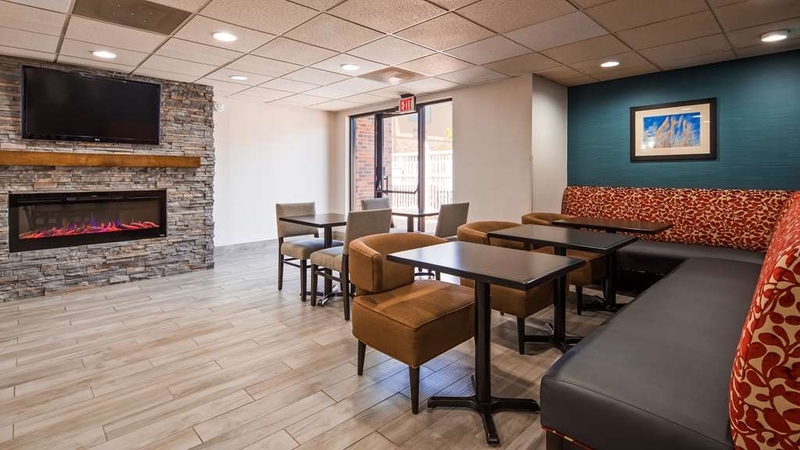 Kendallville, Indiana is not necessarily a tourist destination but if you find yourself in the area for an overnight stay, the Best Western Kendallville Inn is a pleasant resting place. The rooms are clean, comfortable and the staff is incredible friendly. Nice rooms, good sheets and soft bedding and pillows. All in good working order. Wireless Internet worked well. Close to food and work. Workout room was adequate. Quiet. Slept like a baby. Thanks for a good stay. I've stayed at this hotel numerous times when visiting relatives in town. The staff is always friendly. The housekeepers always say hello and good morning when passing them in the hallway. Tonight when I checked in without a reservation, Brad at the desk identified that I had 2 different rewards accounts with slightly different spellings on the names. After calling the rewards program customer care number, I was able to get them merged together which yielded me enough points for a free stay. Thank you Brad! I'm so glad you helped me with this clerical error. I would recommend this hotel to anyone that needs to stay in the area. "Help in time of need." Headed home from my mother-in-law's funeral (funeral in michigan and home in georgia), our truck broke down in Kendallville indiana. Not having much money (what we had needed to be saved for gas and repairs), the night clerk looked for any discounts for us and not finding any, called her supervisor to get the room reduced as much as possible. The night clerk (and manager the next morning) were looking out for us more than for the bottom dollar. We are very pleased with the service and hope to come back under better circumstances. I enjoyed staying at this particular Best Western. Location was helpful to me, as it was easy to find. Rooms have always been clean and employees have always been helpful. It is close to a place where I can get fuel for my vehicle and I liked the idea that I can get 10% off at Applebee's. 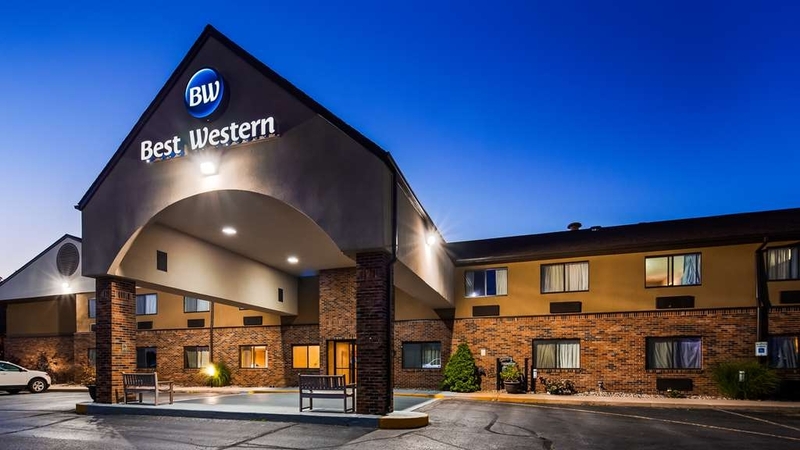 My husband I and I recently spent 2 nights at the Best Western in Kendallville,IN We were very happy with the accommodations. The staff went out of their way to be friendly and helpful. The decor of the hotel was restful and classy without being overdone. The breakfast was very good and well presented. This is definitively a good choice for a hotel stay. 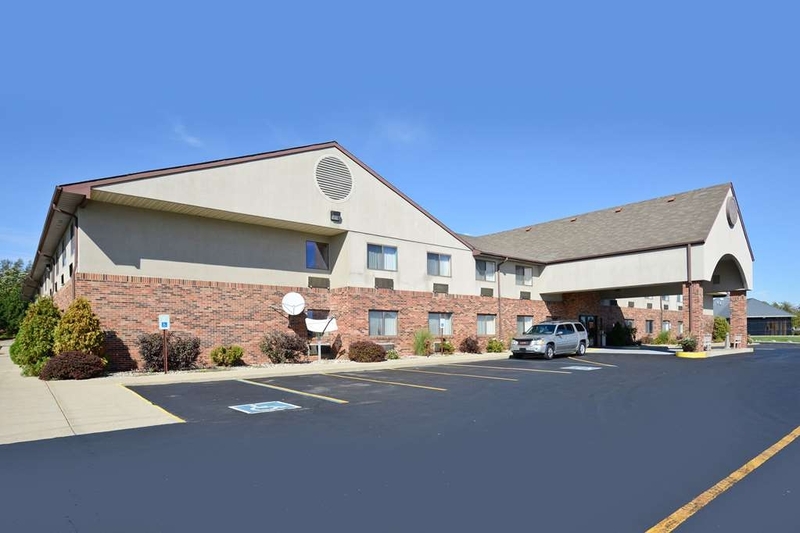 "A nice place to stay in Kendallville, Indiana"
The hotel was clean and well maintained. The staff was friendly and helpful. I would stay at this Best Western again. The time changed during my stay and there was a glitch with the wake-up call, as it came an hour early but stated it was 7:00 am; it was in fact 6:00 am. It was a stay over to connect with a bus trip. Staff graciously accommodated our early departure breakfast needs. It was a very dark, rain night when check in; handicap parking location made it very convenient for unloading and lighted area to see your way. "Really great place to stay!" While on our weekend trip to Indiana we stayed Friday and Saturday night at this hotel. It was solidly booked and we got the last room (lucky us!). Very clean hotel with a welcoming and accommodating staff. Great breakfast with plenty of food and places to sit. Will not hesitate to stay here again. The best Best Western! Best Westerns don't disappoint and this one was better than most. Brad at the front desk was particularly helpful. My husband had injured his leg, the hotel has no elevator, so Brad carried our suitcase up the stairs (and back down again the following morning). Service above and beyond. "Great mid-west small town hotel." My wife and I have spent many nights in this hotel over the years. She has family located near this location. The hotel is very well kept, clean and welcoming. We enjoy the family atmosphere, the breakfast and the evening cookies. We recently had an issue with a reservation and management was very understanding and took care of the issue promptly. We look forward to our next visit to Kendallville and could not imagine staying anywhere else. Always clean and welcoming....everything you can ask for is in these well appointed rooms, down to the night light in the bathroom! Breakfast is delicious, plentiful, with a great variety of options. Hot food is hot and cold food is cold. This is our favorite of all Best Westerns! "Nice place, would stay again"
If your travels take you to Kendallville, stay here. Our room was comfortable, reasonably priced, and everything worked. They had a modest exercise room, and well-kept common areas. Big bonus: fantastic complimentary breakfast, including waffles, eggs, two kinds of sausage, biscuits and gravy, etc. In addition, somewhat uncommon for a hotel in this range, there was a small lounge/bar open nightly from Mon-Sat. Only negative was the shower: low pressure and very soft water resulted in soap and shampoo wanting to stay on you. And my wife adds: FREE POPCORN!!! Overall I enjoyed it, and would stay again. I stayed at the Best Western Kendallville for a wedding. They were incredibly accommodating. Checking in and out was quick and easy, and the front desk even called to see how our room was once we had gotten in. I definitely recommend this hotel and would stay at this chain in other locations as well. We stayed here for a wedding and were very impressed with the team. From check in to check out they were nice and efficient . We have a big loud family that stayed up 'till 2AM playing cards and talking after the reception and they accommodated us. Our stay here was the best that we ever had !! We had to have a handicapped room because my husband is in a wheelchair. The room was large with two full sized beds, a bathroom that he could turn 360*,complete with stationary grab bars and the area below the sink was cut out to better accommodate a wheelchair. The motel also has a breakfast which was great! The hot foods were hot, cold foods were cold and plenty of seating available for many people. The motel has a pool, hot tub, exercise room and popcorn for snacking. 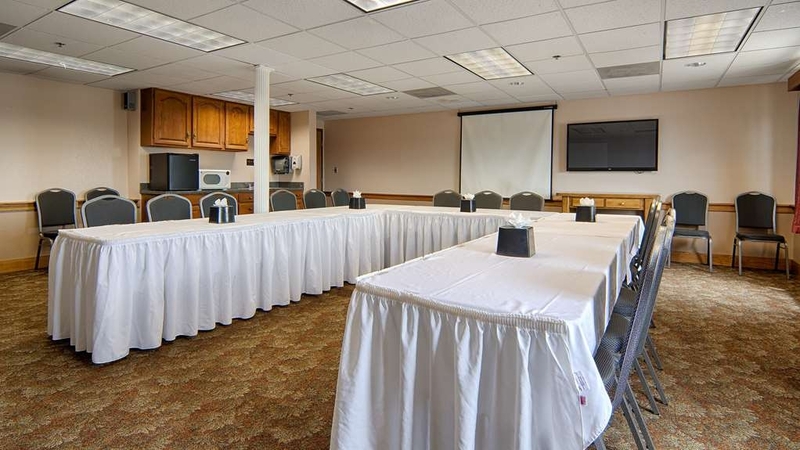 All of the staff was friendly and professional; the room was clean and comfortable. We will definitely stay here again!! The hotel is surrounded by Great Golf Courses. It has a free breakfast, a very friendly bar, and the rooms are very comfortable. 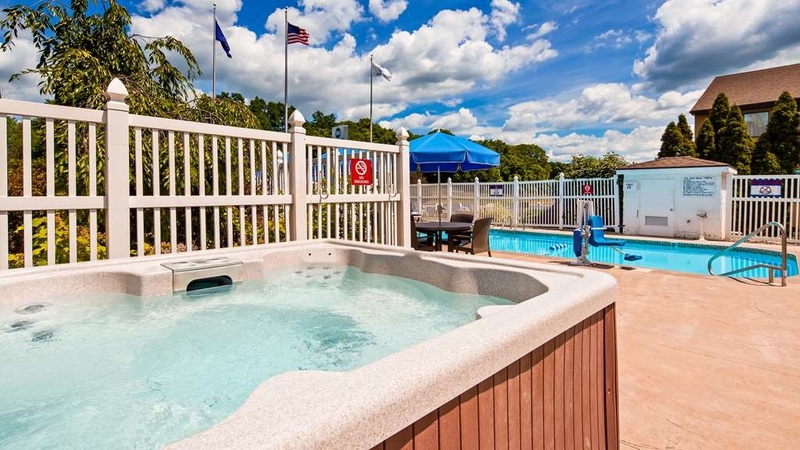 Take a drink at to the pool and relax in the hot tub. The staff is very friendly. Stayed here many times - This visit found room renovated that improves what was already a great place to stay. Staff friendly and helpful. Plan to stay here again whenever in the area. 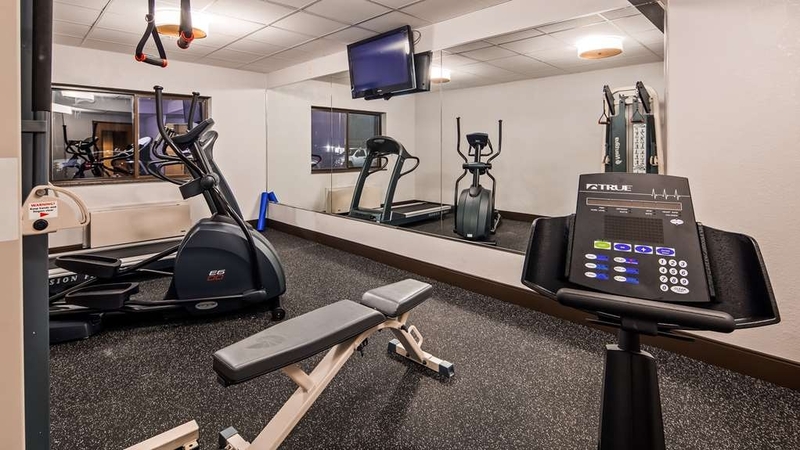 Hotel has lounge and fitness center for those who are in need of these amenities. Also have restaurant close - within walking distance - if one wants more selections.